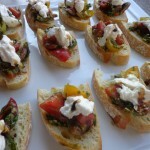 Delicious flavor combinations make this bruschetta magical - watch them disappear! Prepare Pesto: Place garlic in food processor or blender and chop. Add almonds and puree. Add Basil and pulse until combined. Add cheese. With machine running, add olive oil until desired consistency. Season to taste with lemon juice (helps to keep the basil bright green) and kosher salt. Prepare Balsamic Reduction: Place vinegar, sugar and peppercorns in a small saucepan over medium high heat and boil until large bubbles form across the surface that slowly pop. Remove, strain into a small bowl and cool. May be stored at room temperature. Assemble Bruschetta: Toss tomatoes with pesto in a small bowl. Top each bread slice with tomatoes. Top tomatoes with a small amount of the mozzarella Drizzle with balsamic reduction. Serve immediately.